Marty Whelan broadcasted from...near the Ploughing! Roads, car parks, hotel lobbies and coffee shops around Screggan were packed with people, exhibitors and RTÉ presenters who were eager to kick off Day 2 of the Ploughing Championships before it was cancelled. Gates were due to open at 9am this morning for the second day of the 87th National Ploughing Championships however Storm Ali had other plans and concerns for safety on the site increased along with wind speed and strength in Tullamore. 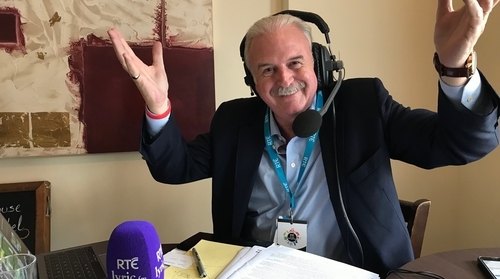 Ever the pro, Marty Whelan who was due to present Marty in the Morning on Lyric FM live from the RTÉ Tent in the Ploughing HQ this morning, and on our Live-stream, decided the show must go on. He, and his brill production team (Sinead Wlyde, Producer and Michael O'Kane, Production Coordinator) broadcasted from the doorway of The Central Hotel, as members of the public took selfies with him working in the background. We're as near to the Ploughing as we can be and this new studio location was used for the day as News on One also broadcasted from here and The Ray D'Arcy Show will broadcast from here too. Despite the disappointment over many cancelled events at the Ploughing, including our Hourglass podcast event, Bláthnaid Ní Chofaigh was offering a helping hand where possible, as below and is a guest on today's Ray D'Arcy Show. The RTÉ stand is located at Block 2, Row 13, Stand 271 where you can watch live radio shows, have a go at presenting the weather, become an RTÉ Guide Cover Star, check out the RTÉ Archives, RTÉ Shop, Saorview Connect and more. 19:00: Ploughing Live presented by Áine Lawlor & Marty Morrissey on RTÉ One. Our own Hourglass panel event was due to be broadcast from the RTÉ tent today, Wednesday from 4:45pm to 5:30pm. Taragh Loughrey-Grant was due to speak with Blathnaid Ni Chofaigh, Áine Lawlor, Alma Jordan of Agrikids and Lorcan McCabe, Deputy President of the Irish Creamery Milk Suppliers Association about farming inheritance, farm safety especially for children, the role of the Irish mammy in modern society and the health benefits of going back to basics, back to the land. Fingers crossed it'll go ahead as planned, albeit on a new location.